A highlight of Giles Havergal’s era as artistic director at the Citizens, this revival of Travels With My Aunt arrives freighted with expectation. Fortunately, Havergal’s sensitive adaptation of Graham Greene’s novel allows the clarity of the prose to shine and the strong ensemble performances ensure that Philip Breen’s production is far more than a nostalgic remounting. With the themes of conformity and rebellion retaining a contemporary relevance, and the moral conflicts still dynamic, Breen’s direction manages both the humour and the increasing darkness of the second act, entertaining and provoking in equal measure. 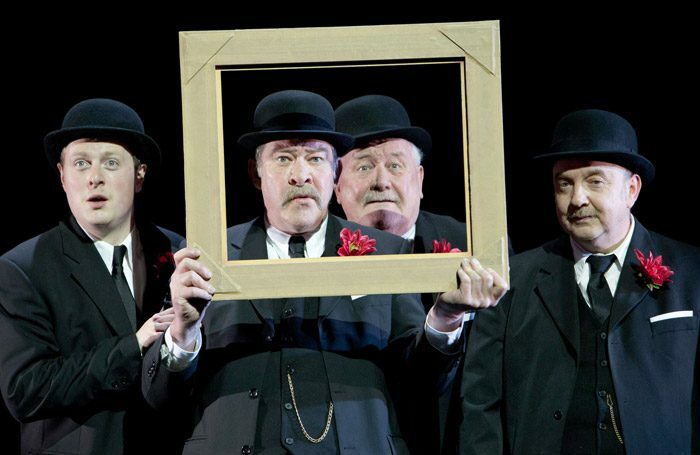 With the four male cast members sharing the roles – all dressed as protagonist Henry, a mild-mannered retired banker – the adaptation becomes a masterclass in theatrical storytelling. Henry’s relationship with his Aunt Augusta becomes a seduction of an innocent into a world of minor war criminals, smuggling and pragmatic CIA agents, with interludes in the counterculture of the 1960s. The versatility of the actors, and Greene’s telling dissection of respectability’s soul-destroying consequences, turn these episodic adventures into a complex story of unlikely redemption and acceptance. Designer Mark Bailey situates the action in an indeterminate space that expresses both the spiritual emptiness of the retired banker’s London and the wide open spaces of South America, while conjuring the excitement of travel: simple chairs transforming into trains and hotel rooms. Some of the characters are inevitably underdeveloped and Augusta’s lover Winston is represented as a crude racial stereotype. The morality of the conclusion is left hanging, yet Breen’s production celebrates this past triumph by drawing out its modern theatrical and social relevance. Charming and sprightly, its lightness of touch emphasises the power of Greene’s social message.